Devastating wildfires have brought California’s utilities and policymakers face to face with a hard choice, illustrated last fall by the experience of Pacific Gas and Electric (PG&E), the state’s biggest electricity provider. 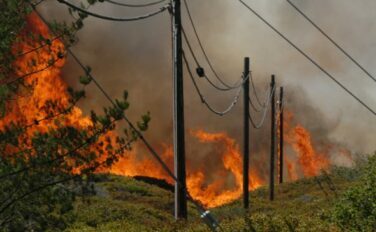 In October 2018, PG&E, faced with an imminent wildfire threat, shut off power lines in high risk areas. Customers protested at being without electricity, but no fire occurred. The next month, facing another wildfire threat, PG&E, with protests still echoing, did not de-energize lines. The Camp Fire followed, killing 86 people and destroying 18,661 structures. There is no way to prove de-energizing avoided a fire in October or that not de-energizing caused the Camp Fire. All of California’s utilities face the dilemma as they prepare for the coming wildfire season. But distributed resources could provide a part of the solution. De-energizing power lines is the emerging favorite among preventions for deadly wildfires like those California saw in 2017 and 2018. San Diego Gas and Electric (SDG&E) has avoided catastrophic wildfires since 2007 using it as part of a comprehensive strategy. But turning off power is controversial because it can put vulnerable customers at risk, impose business losses, and leave first responders hampered. There were 146 claims for losses against PG&E after the October shutoff, including 25 claims of business economic impacts, according to the utility. De-energizing lines is expected to be a central topic in comments about wildfire mitigation plans filed February 6 by the state’s investor-owned utilities (IOUs) with the California Public Utilities Commission (CPUC). The plans, required by the Senate Bill 901 passed in 2018, all include proposals for de-energizing. “If there is an urgent and present danger, and the utility going black can ameliorate it, it has to be done,” Chris Marnay, senior scientific fellow at Lawrence Berkeley National Laboratory (LBNL) and economics professor, emailed Utility Dive. That makes de-energizing the best near-term option because implementing other mitigations will take years and billions of dollars, while power shutoffs “should be relatively quick and easy,” University of California (UC) economist Meredith Fowlie recently wrote. And many say readily deployable cost-effective distributed resources can minimize customer backlash by providing them with a way to manage without electricity. If policymakers are willing to take on the cost, this could be a “third way” that provides acceptable safety while the state and its utilities take on the job of real mitigation. SDG&E initiated mitigations after a catastrophic 2007 wildfire for which its negligence cost shareholders $379 million. Experts in firefighting, fire science and meteorology created a comprehensive program covering situational awareness to monitor the utility’s transmission and distribution system and operational procedures to minimize ignitions, its Feb. 6 filing reported. Mitigations included a network of weather stations and high-performance computers to assimilate and make weather data actionable. Vegetation management and system hardening programs were developed. A network of mountaintop cameras, fire-suppression equipment, firefighting personnel and protocols for their deployment were developed. SDG&E’s 2019 Wildfire Mitigation Plan expands those programs, SDG&E spokesperson Allison Torres told Utility Dive. It also includes improvements in de-energizing lines. “Intellirupters will decrease the number of customers impacted, by limiting circuit shutoffs to the location of the threat,” Torres said. The utility also added nine resource centers in high fire danger areas to provide necessities and access to reliable essential information during shutoffs. Plans filed by both PG&E and Southern California Edison (SCE) follow SDG&E’s template, their filings reported. PG&E’s 2019 plan will expand its weather stations, cameras, inspections, vegetation management and infrastructure hardening, with an initial cost of estimate of $1.7 billion to $2.3 billion, PG&E spokesperson Lynsey Paulo told Utility Dive. Many say PG&E’s January 29 bankruptcy filing, due largely to liability for wildfire destruction, could have been avoided if it had implemented these kinds of mitigations sooner. That remains to be litigated. In the interim, the utility was granted debtor-in-possession (DIP) financing January 30. That ensures funding from the private sector for “essential maintenance and continued investments in safety and reliability for the expected duration” of the bankruptcy proceeding, Paulo added. PG&E is also “expanding its Public Safety Power Shutoff (PSPS) program,” its filing reported. New criteria for shutoffs will protect against “impacts to first responders and vulnerable customers, including those with medical needs,” PG&E said. Predictably, there is much debate over these plans’s costs. They will require “a mobilization and almost a war effort,” State Senator Jerry Hill, a Democrat representing a PG&E-served district, told Utility Dive. TURN and other stakeholders will have input, and there will be legislative oversight, but it will be up to the CPUC to oversee spending. But “spending now to clear trees can save a lot of spending later on suppression and recovery,” State Senator Bob Wieckowski, Democratic Chair of the Senate budget committee, told Utility Dive. In the decision over whether to de-energize, utilities are caught between their safety concerns and their obligation to provide reliable power, UC’s Fowlie wrote. “It would be wonderful if we could snap our fingers and clear all the dead trees, but on our present trajectory, mitigations will take at least five years to six years,” Senator Wieckowski said. That makes de-energizing the near-term solution, but it must be done right, the lawmakers and TURN’s Spatt agreed. “My concern is unintended consequences that could be pretty extreme,” Assemblymember Wood said. Examples would be loss of communications with first responders or the disruption of medical services to homebound customers. But SDG&E’s record “shows it is possible for a utility to operate safely, and we have not heard major complaints about its de-energizing,” Spatt said. At 24 hours out, the utility knows which communities may require shutoffs, notifies those customers, and refers them to information on the SDG&E website. At that point, she acknowledged, their only options are to prepare to live without utility electricity or evacuate. The decision criteria and practices outlined in both the PG&E and SCE plans follow those Torres described. “If I was running a utility, I would de-energize whenever there is any risk whatsoever of liability for wildfire damages,” Stanford University economist Frank A. Wolak told Utility Dive. Wolak is Director of Stanford’s Program on Energy and Sustainable Development. Policymakers can set limits on utilities’ liability and impose costs for wildfire losses on those who build in vulnerable locations, Wolak said. Or they can set clear, transparent safety standards and approve utility expenditures to achieve them. Wolak may underestimate the readiness of the public to take on the wildfire challenge. A way to potentially de-energize and have electricity is possible if affordable distributed generation can be made available to those in high fire risk areas. De-energizing is the best answer we have right now, Senator Wieckowski said. “In the budget negotiations, we will probably think about providing incentives for preparedness measures, including backup power.” Assemblyman Wood and Senator Hill agreed the idea of backup is worth considering. For all mitigations, “the problem is cost,” LBNL’s Marnay said. Distributed resources as backup power can make de-energizing safer, but taxpayers “in safer areas” will likely be unwilling to share the cost of incentives to deploy them. Both PG&E’s Paulo and SDG&E’s Torres said the utilities are working on programs to support the deployment of backup power but details are not yet available. De-energizing has economic impacts which could justify expenditures for alternative resources, she added. The cost of solar-plus-storage systems has dropped significantly and is projected to keep dropping, according to Fowlie’s UC economics graduate student Will Gorman. Systems that can meet 95% of typical homeowners’ demand can be installed for as little as $1,500/year, and systems that meet 100% of their demand would cost $3,000/year to $6,000/year, he emailed Utility Dive. Together with public and philanthropic funding, adequate backup power could be positioned to prepare targeted communities in high fire risk areas for de-energizing when it is necessary, Hoskins said. That might allow California to endure the wildfires until real mitigations can be implemented.